The equipment of the MI and more! 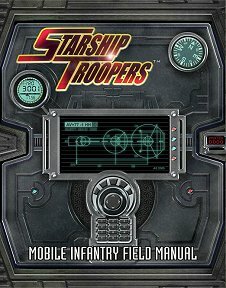 Publisher's blurb: "Everything you need to know about fighting aliens on distant worlds is contained in this book - no Trooper should be without it! Equipping Squads Bored with the Logistics Corp constantly denying your requests for heavy weaponry? Find out how to equip your entire squad with all manner of interesting weapons and equipment as standard issue! Toys, Toys, Toys! Weapons, armour, kit, vehicles, and much more. Learn how to use Exosuits, master the Spitball rocket launcher and graft new cybernetics onto your tired, battered body! Cross-Training Done your tours as a Field Medic or Engineer? Increase the scope of your MI career and become a Chaplain, or sign up for Selection into the Pathfinders! Promotions and Awards Got your eye on the Sergeant's chevrons? We tell you how. Want to forget about leadership and concentrate on earning shiney medals for your chest? All the secrets are here! "The Mobile Infantry Field Manual - you would be crazy to leave base without it..."